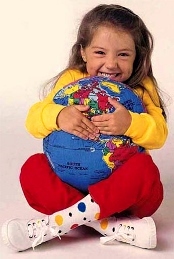 The HUGG-A-PLANET EARTH globe is an environmentally friendly (made from fibre-filled, sturdy cotton), soft, educational and huggable planet earth toy. The globe identifies over 600 place names of the Earth in fantastic detail. 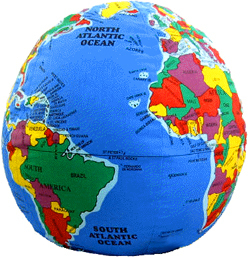 This brightly colored globe is a friendly learning tool, a wonderful hands-on reference to help children to understand better the world geographically, important events that take place and environmental stewardship. The Hugg-A-Planet, Earth is one of those unique toys the whole family can use. CHILDREN AS YOUNG as one enjoy it. Why? It is easy for them to catch, light and soft enough to carry. FOR THE TODDLER: a two year old can start learning geography by playing simple recognition and memory games with their parents, or just exploring the colourful details and maps. FOR TEENS & ADULTS: an excellent and fun reference for world events, and unusual gifts, or simply as a comfy way to snuggle up with while watching TV. This globe is easy to clean and machine washable. Available in a 30 cm size. English language.